A week after the last race of the Port Stephens Regatta we are still drying sails. We are not alone as on Friday we found a fellow club member at Greenwich with sails hoisted on every flag mast for washing and drying. We had already dried two spinnakers at home and returned these to Passion X. In windless but sunny conditions we hoisted the wet No 3 jib on the forestay and rolled out the damp Code Zero in the continuous line furler. Every time I hoist the Code Zero it seems easier to set up and bring down and Friday was no exception. That left two very soggy No 1 genoas, the heavy and light ones, which I wanted to wash thoroughly with fresh water so these came home for the Easter weekend. 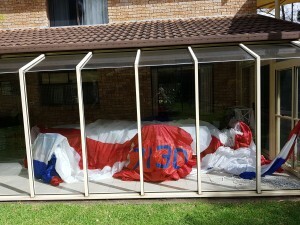 The wash and dry was an opportunity to lay out the genoas on top of each other and see the differences. 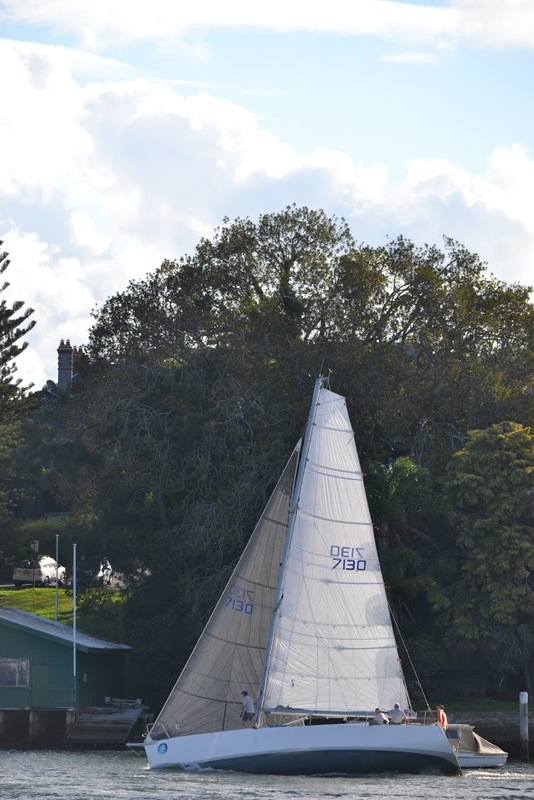 For good measure I photographed the sails on the back lawn. The new No 1 heavy is marginally smaller than the No 1 light but quite a bit larger than the old No 1 heavy or 1.5 as I liked to call it. 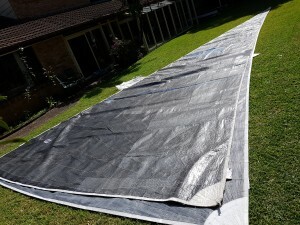 The extra area is low down on the deck and with more overlap low down so hopefully it will be good all purpose sail so we can keep the 44m2 No 1 light for lighter conditions. Obsessively I have been weighing the equipment as it comes off Passion X to see what weight we can save for the winter series. So far about 100 kgs is in the house including 5 kg from the front berth cushions which were getting very wet during the racing and will go back on only when cruising with another couple. 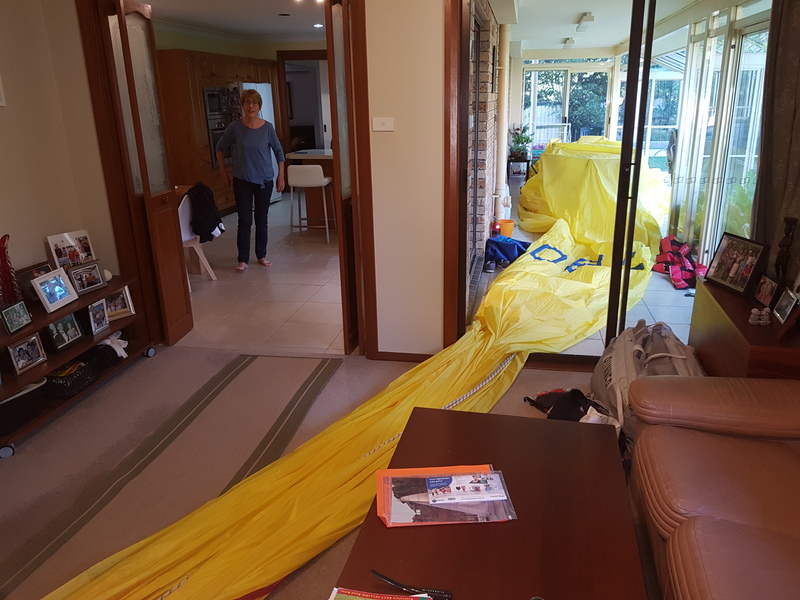 I have yet to remove the No 4 jib which has not been used since the race management at RANSA has become very cautions and the storm jib which has not been out of the sail bag since purchase. These will save another 30 kg and bring the total up to only 130 kg so I do wonder if it is worth all the effort. We did end up victorious in the Greenwich Flying Squadron Twilight handicap series for the full season. A good Spring series and a late run at the results in the Autumn series sealed the result. Meticulous attention to the cleanliness of the hull was the secret as we have a fair amount of wetted surface for our weight and not a lot of righting moment to use to power up the rig. The No 1 light, underneath, is only marginally larger than the No 1 heavy but is about 4kg lighter. Despite the forecast for little breeze we set out today to practice our spinnaker work and to hoist our new No1 heavy genoa. To our delight the breeze kicked in at around 12 knots which was a perfect test for a perfect new genoa. 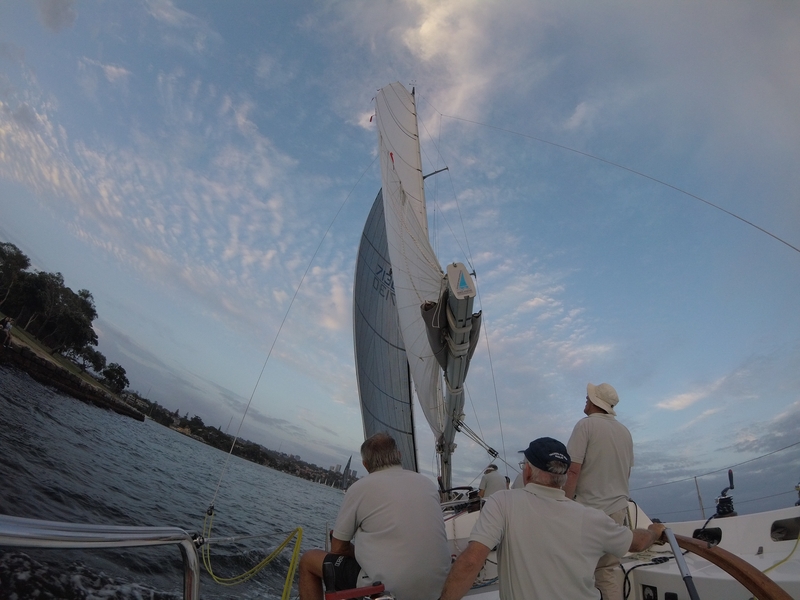 We worked up to Manly with very little traffic to disturb our trip and tuned around and hoisted our fractional spinnaker. After a second work back up the harbour we hoisted the 6o sq metres code zero and gybed that four times on the way back to Greenwich. 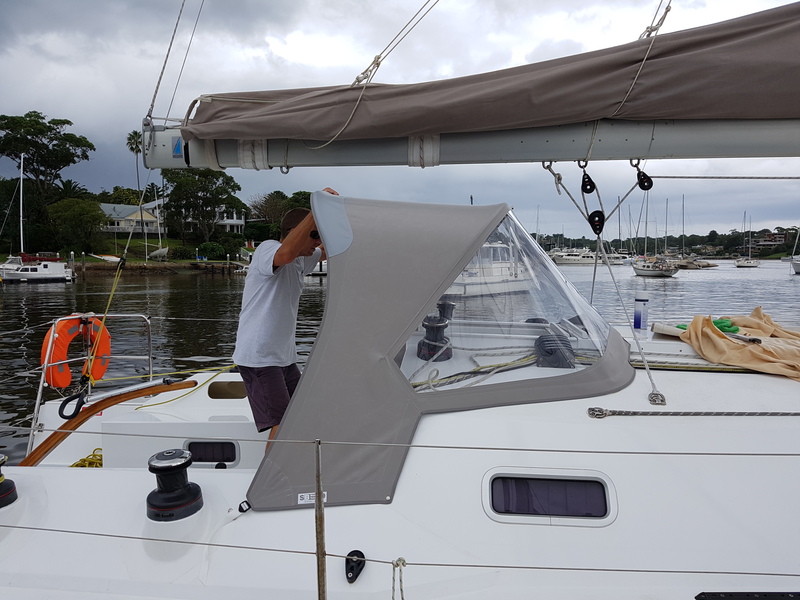 We practiced gybing outside the forestay but settled for furling the code zero and unfurling on the opposite gybe which seemed more effective and less susceptible to problems. 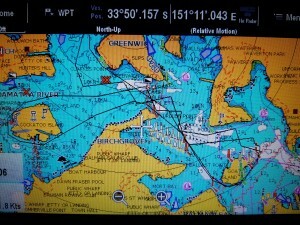 It was a long but very enjoyable afternoon during which we hit our windward speed targets a few times. The new genoa is a Dimension Polyant Carbon Sports light skin with the same area as our old No 1 from Passion which had been recut to fit around the shrouds on Passion X. 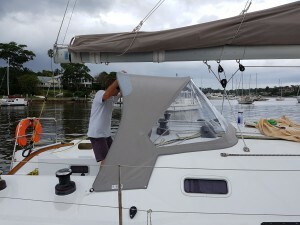 The new sail is longer on the foot and can be sheeted closer to the deck while still clearing the shrouds. 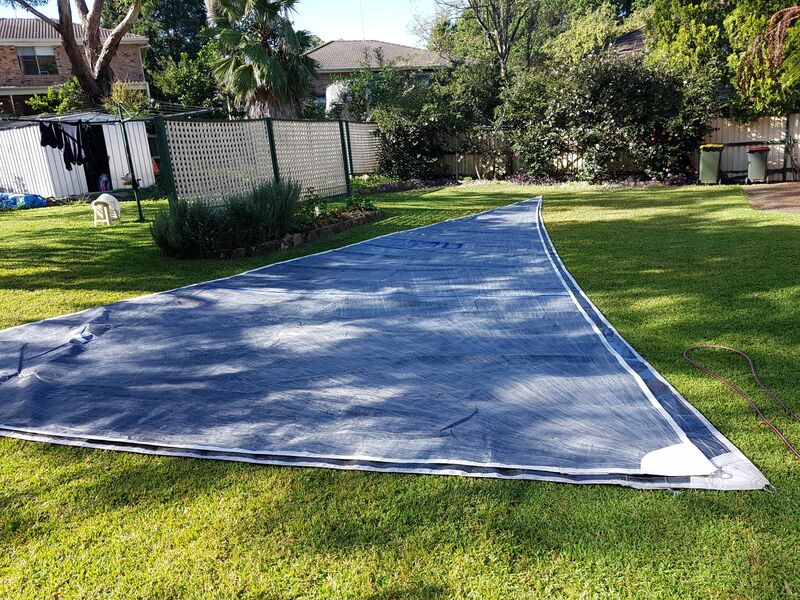 More of the area is lower down and forming a better end plate with the deck so we are hopeful that it will be useful over a wider wind range and we are very pleased with the first sail. 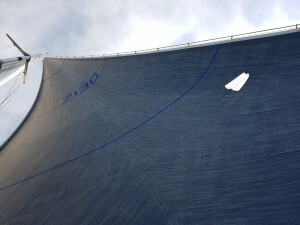 Our new No 1 heavy genoa our for a test sail where we hit our speed targets several times. The run out tide and no wind resulted in us being carried well over the start line with minutes still to go. Unfortunately there was not enough wind to get us back over the line in time so we were forced to go around the end and start three and a half minutes later than the fleet. All was not lost as a following breeze sprang up and assisted by the tide we drifted down on the Blank and Green and White fleet yachts still becalmed in Humbug. 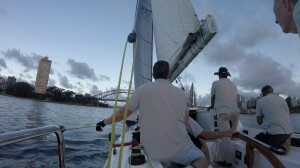 The Commodore very kindly let us go along the Onion Point shore on starboard tack. 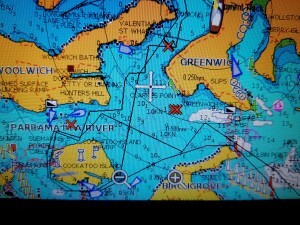 This allowed us to make up some ground but we had to be on the other side of the fleet on port tack. 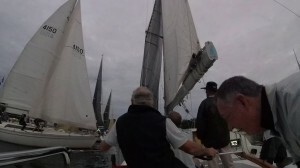 We waited for an opportunity to gybe very sharply and take the stern of about twenty yachts who were going the other way and being very wide we skirted the fleet. 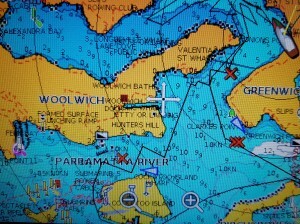 In the light air beam reaching we held Utopia all the way to Goat Island. It was only in the lee of Goat that Utopia crept away. Meantime Dump Truck who had been becalmed at Greenwich arrived at Goat Island to add to the fleet. 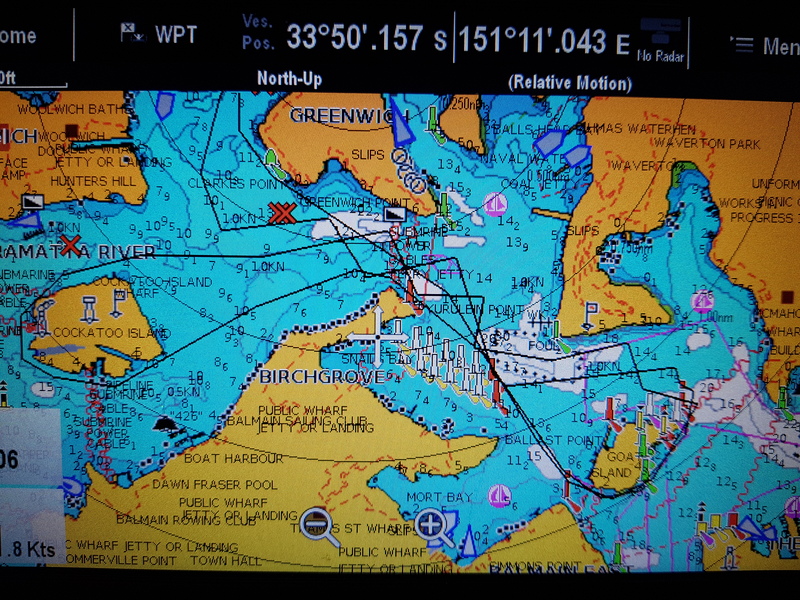 Avalon was around Goat Island but becalmed. Jackpot was parked just behind and Joli just behind Jackpot. Utopia found some different breeze and went closer to Goat Island than we thought was wise but Dump Truck did the same and made it through. Apart from Dump Truck the fleet more or less came out of the Goat Island rounding as they went in which left us chasing on the reach and run to Cockatoo Island. 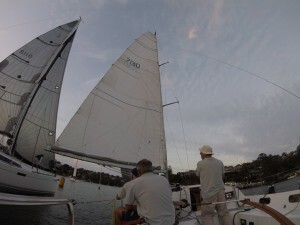 With a bit of following breeze Ausreo came up to our stern but fortunately we trimmed the sails a accelerated away. We were relieved that Ausreo called it a night and went home as that let us to concentrate on poling out the big genoa and chasing the leaders. Along the run we drew up to Joli who promptly passed us on the work back to Humbug. In the fading light it was impossible to see the tell tales on the black genoa so I was sailing part by instruments and part by the call of the crew. I was now dark in Humbug and impossible to see the shifts. What I can see from the tracks is that we did a pretty terrible job on the way through Humbug but even a miracle run would not have been enough to finish on time. Today I assigned all the bulkhead instruments to a group display so that by adjusting one knob I will be able to dim all the instruments. That might make seeing the sails in the dark a little easier. Avalon, Jackpot and Dump Truck all made the cut off. Dump Truck was the last to finish at 20:12:03 with 2:57 to spare. At the 20:15:00.0000 cut off we were just at Onion Point bearing away for the line. Somewhere in between Utopia and Joli were caught by the unforgiving guillotine of the absolute deadline. Just one of the three finishers turned up for the post race presentation which left two places to be drawn by lucky dip and Joli and Passion X each won one of those prizes. The other prize for the evening was some very good photos taken of Passion X by one of the crew on Grandparent duty the previous Wednesday. I have taken a photograph of some of these but will get the digital versions in due course. Passion X from the previous week. Another good photo taken by absent crew. A less than ideal path through Humbug on the futile work home. Had the forecast 25 knots turned up as planned we could have been famous and come home with a roaring southerly but it was not to be. 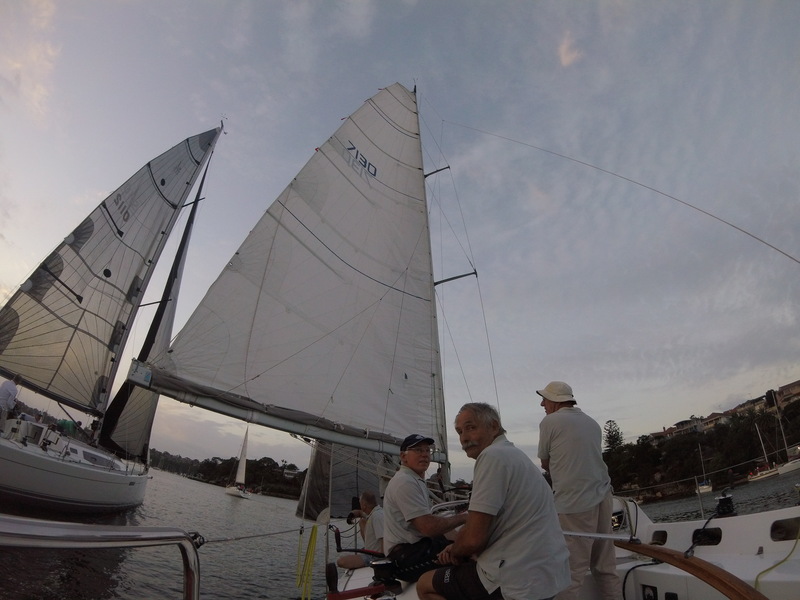 Our cautious selection of a heavy air No 3 jib looked ok as we picked the start well and the breeze held well over 5 knots. We won the race into Humbug and kept the lead to the corner of Cockatoo Island. At that point the breeze and our luck ran out. 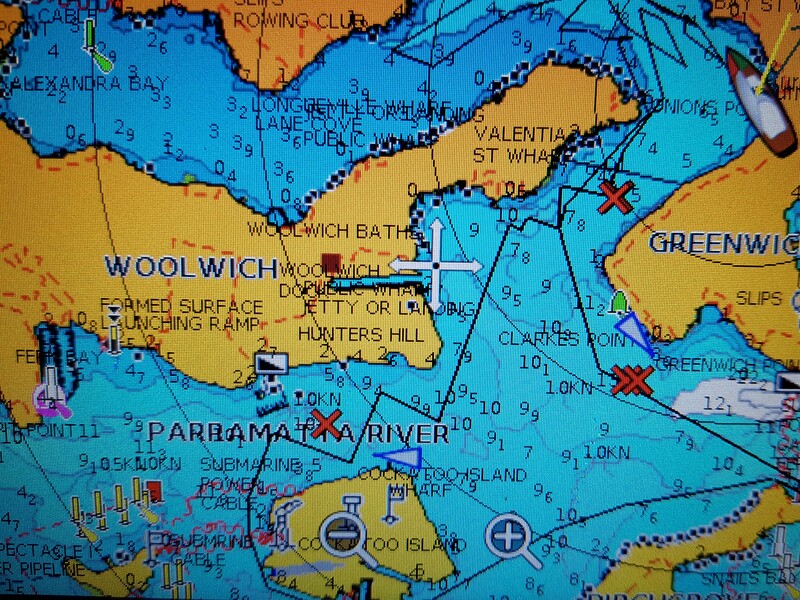 In turn Avalon, Utopia and Jackpot ran past and lead around the corner of the island to start the work to Goat Island. We made a tactical mistake at this stage of staying too close to the leeward side of Cockatoo Island and waiting for the breeze while Joli and Fireball went lower and faster. 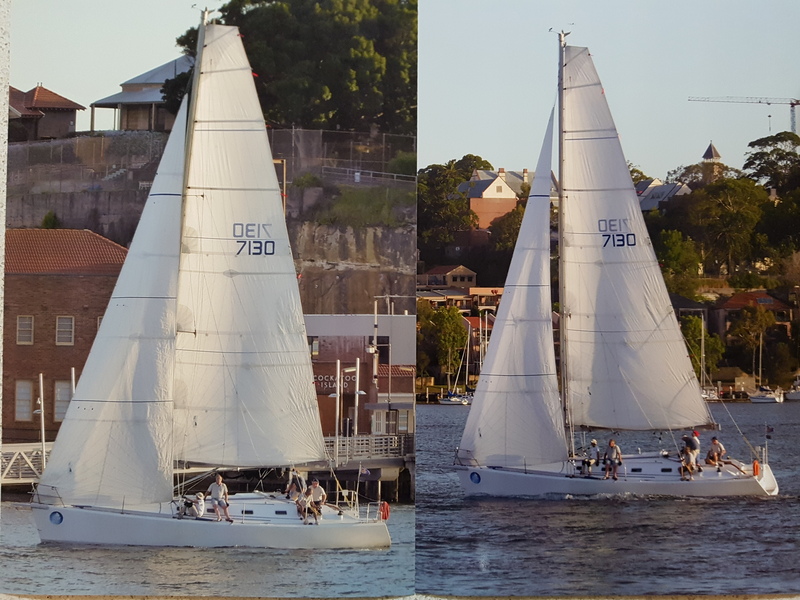 Full marks to Fireball for going the lowest along the Hunters Hill shore and then along the Greenwich shore completely skirting the windward yachts. Our small heavy weather jib was not helping but we would have gone a lot better if we had lead Fireball along the norther shore lines where the outgoing tide was the strongest. 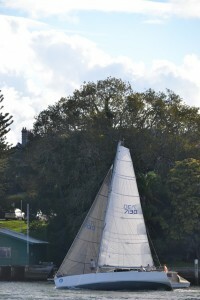 By the time we arrived at Goat Island the breeze had died even further and as we rounded the eastern end we could see Avalon coming out of the western end on the way back to the club. The rest of the race was a lonely event as our small sail area and dying breeze did not give us much hope of making up any ground. Lisdillon was coming up from behind and our last challenge for the evening was to stay in front until the finishing line. This we did by a small margin and that left Sweet Chariot out on the course with not much help from the wind to come home. Thanks to the good start and a bit of breeze for the first quarter of the race we managed to hold on for 6th fastest and 6th on handicap with 35 minutes to spare to cut off time. The Blue fleet who started 5 minutes later and did a similar length course were still out on the water well after our finish and three yachts from different fleets failed to complete at the 8:15 cut off time. It was sad seeing them just metres from the line at the cut off time. Now the forecast wind decided to arrive about 10 minutes after the 8:15 deadline and was already building as I motored to the mooring. Fireball with good tactics won the handicap by a couple of minutes from Avalon with Utopia a further four minutes on handicap back. 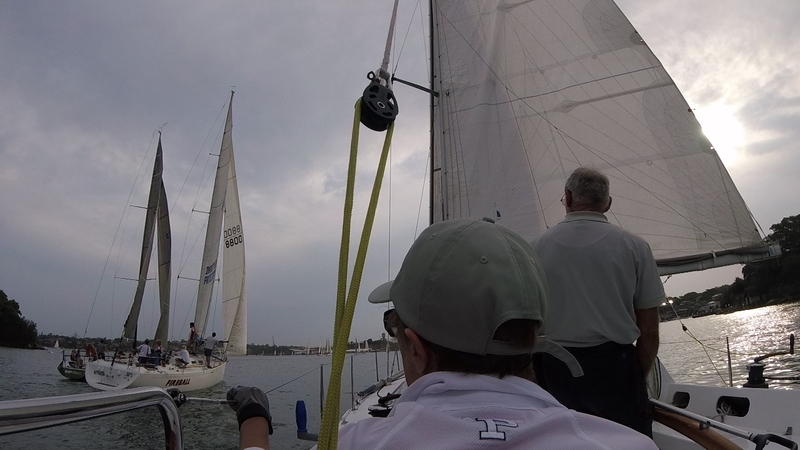 We were 9 minutes away from first on handicap and unlikely to have beaten Fireball with any head sail we chose. We might however have got onto the podium as we were less that four minutes behind Utopia. 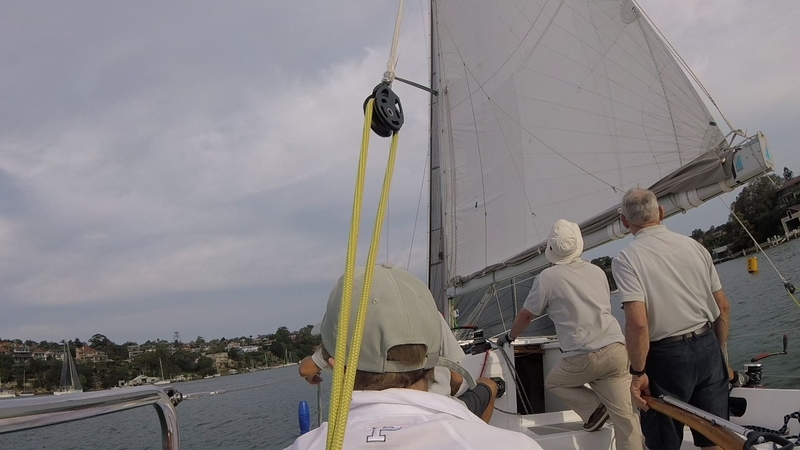 It was an interesting experiment but our jib is just too small for these light winds. Breeze is up the vang needs to come on. Breeze has died. Need more twist. Vang should be off and halyard eased more. Joli looks to have it right. 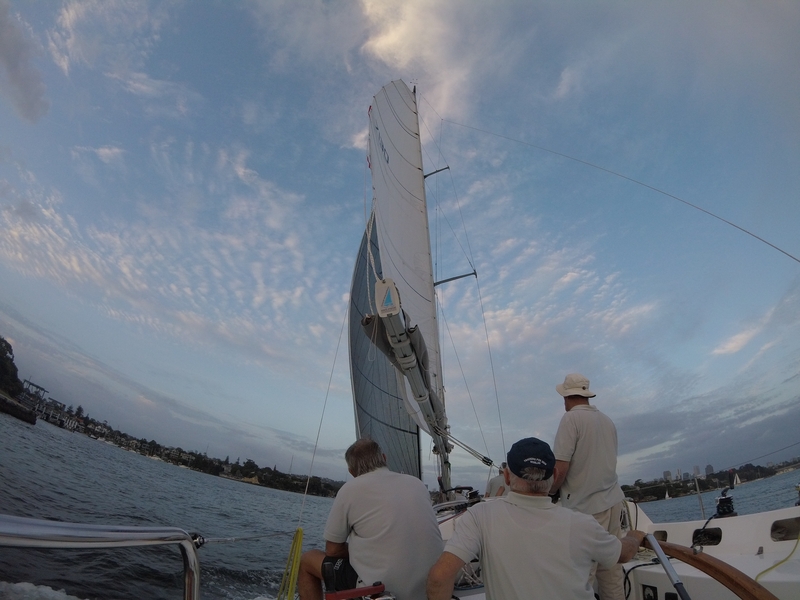 Last week I aimed the GoPro higher up into the mainsail to get a full picture of the leech twist and the footage is instructive. 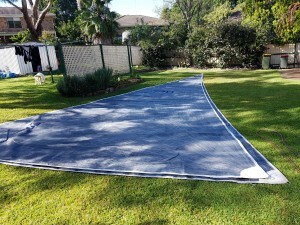 As the breeze freshens the mainsail shape responds well to extra vang tension but, and it is an important but, the vang needs to be released very promptly as the breeze lightens. In the really light patches the main halyard also needs to be eased so that the battens are not compressed hooking the leech to windward. There are some good photos on the leg back from Cockatoo Island back into Humbug and as we approach Onions Point the photos show we have the straightest leech while our competitors have already eased their gear and perhaps excessively so. If we can all find the right twist there might be less shout. Apologies to Chubby Checker and to the young who never heard of the song Twist and Shout. Now for something completely different! 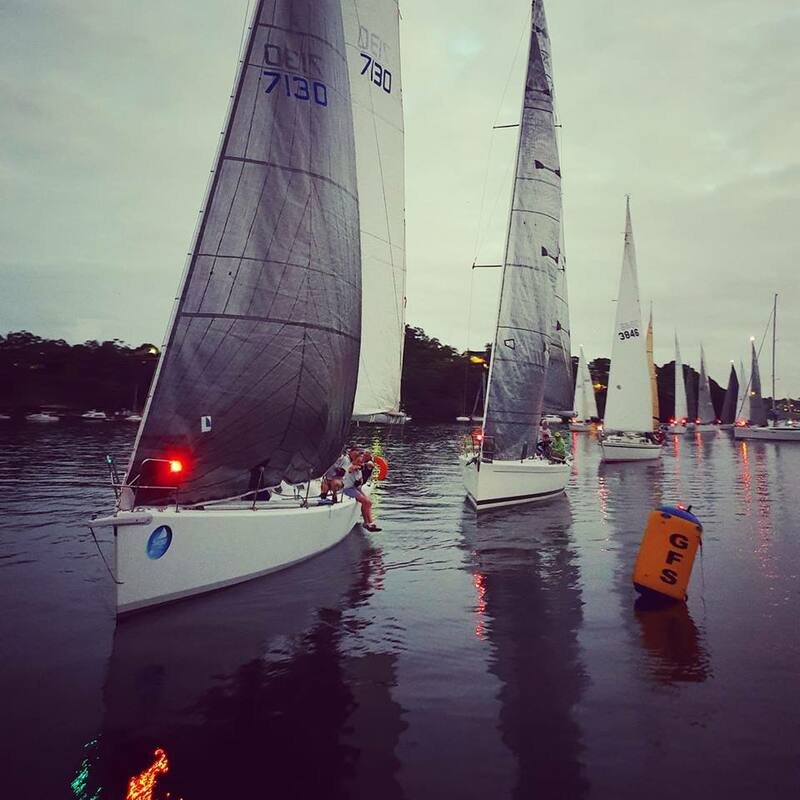 Over the weekend we had a Laser Masters regatta at South Lake Macquarie Yacht Club with the crew of Passion X both organizing and participating in the event. 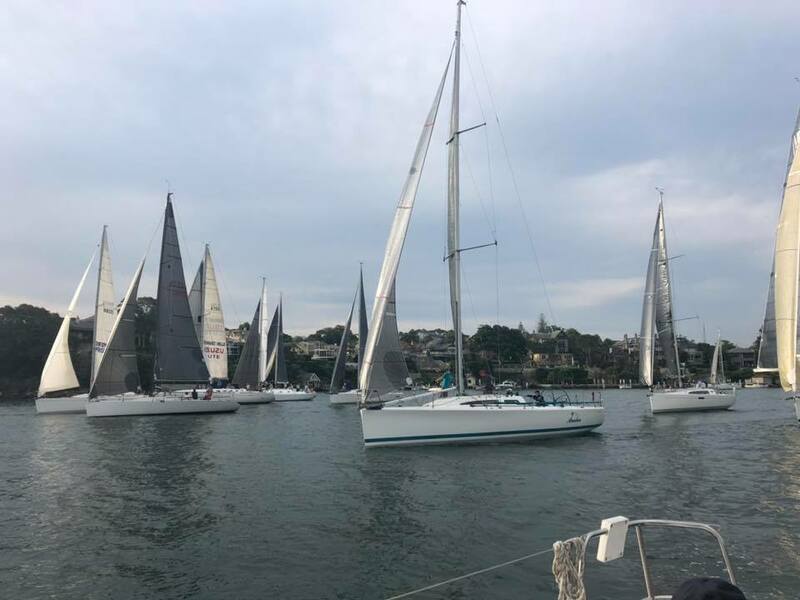 Over the course of two days racing we learnt both from results and local anecdote that the south side of the Wangi shore is favoured and a good line of breeze comes over the low point in the peninsular. 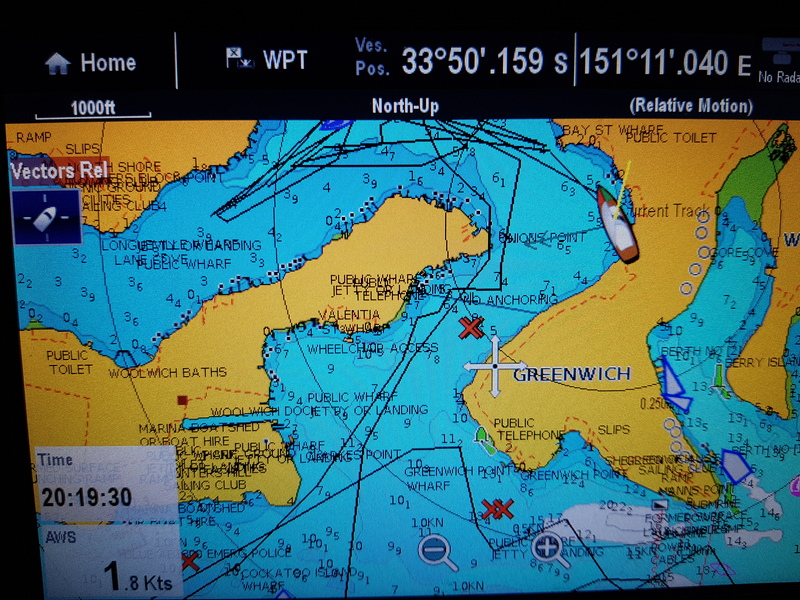 Some of the shifts could be seen coming across the course and the yachts ahead were a reasonable indication of what was coming our way. When the line was not biased to the pin end too much I opted for the safe start behind the boat end fleet with the option to tack away for clear air. When I could tack away I went back onto starboard and worked as hard as possible to get down to the pin end starters who were knocking into a big shift ready to tack to port for big gains. In several races I was lucky enough to get enough right hand shifts to work back to the left of the course. 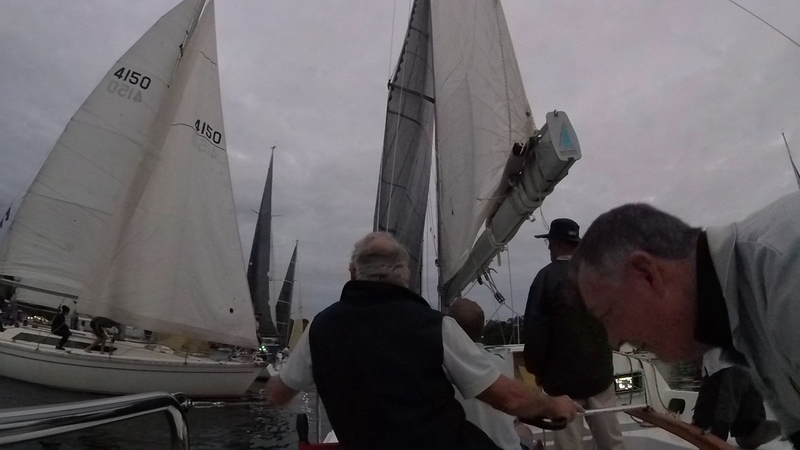 In the second race on the Saturday I took one long board to the port tack lay line and reached in when the late lift from the left arrived. My mistake after the downwind leg was to take the port gate mark and lose four or five places immediately. In the last race I opted for a start just above the pin and went hard left. The good starters were giving me dirty air but I persevered going as far left as the lay line. I was fortunate that most of the yachts ahead tacked as soon as the breeze headed and did not go far enough into the new breeze. 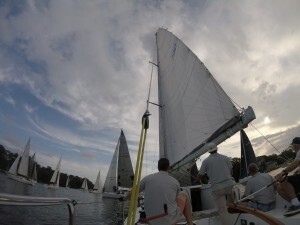 For the second race of the weekend I was in the top few at the first mark and with clear air to sail my race. 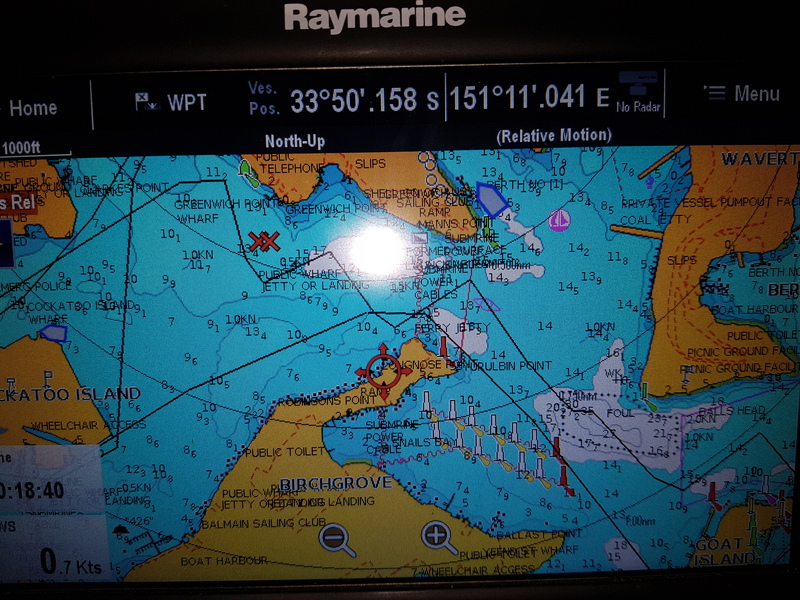 The good younger skippers behind made life difficult and I was forced away from my route into the favored shore line but I did manage to get back in the next two shifts but not far enough. I was a little too low to get the benefit of the big lift into the top mark but did manage to hold onto fifth place for the second mark rounding and finish with a sixth and a cube for the weekend’s effort. 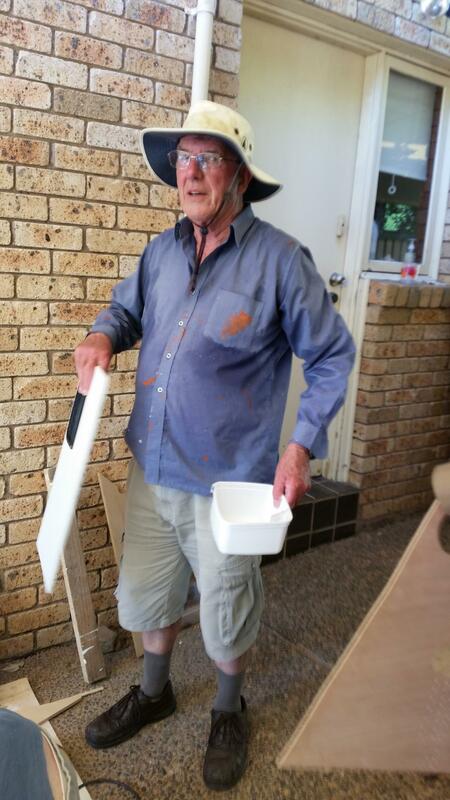 What was good about the weekend was to see clearly the results of decisions both good and bad. 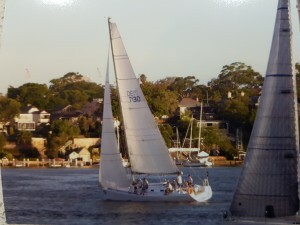 In two races I tacked early to the finish line and was run over by yachts that came in more free and faster on starboard. 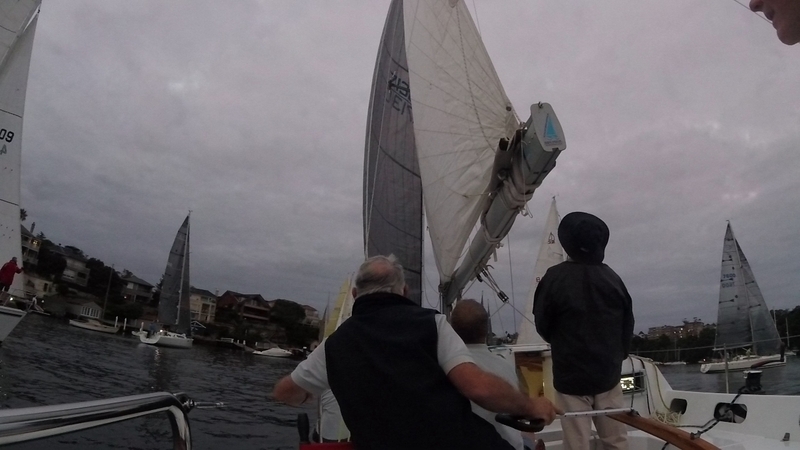 In both races the line was so heavily biased to the finish boat that it could not be crossed on starboard. After one such incident I should have know better than to repeat the mistake. The other mistake was taking the left gate mark because it was less congested rather than join the queue on the right mark and work to the left of the course. The worst result and the discard was when I was trapped mid fleet below a long line of boat end starters and could not get over to clear air. The good decisions were the ones where I kept looking up the course for the next shift and planning when to go left or right. What was particularly pleasing was when competitors tacked away too early or hung on too long. That gave me the encouragement to work harder and today I can feel the effects of that hard work. 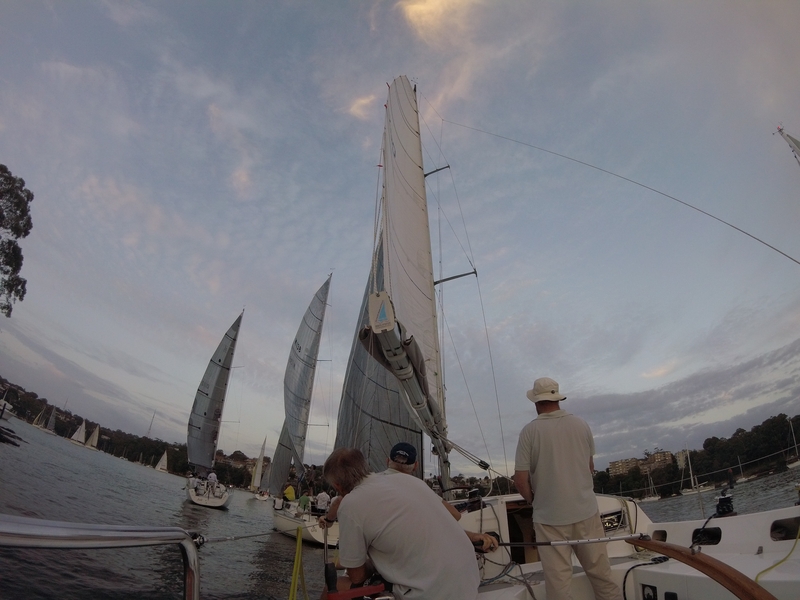 In my age division I finished behind two super human yachtsmen, both club mates from Middle Harbour Amateurs. Our newest Great Grand Master competitor won five of the six races and our past World Champion came from behind on the last day for a convincing second place in our age group. 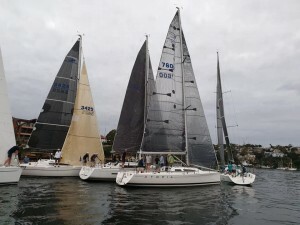 The Middle Harbour Radial fleet had an impressive string of victories. This week it will be back to Greenwich Flying Squadron where the wind in Humbug is unpredictable, the shifts difficult to see and unlike the weekend on the Laser, leaning harder does not have the same result. Passion X and Joli battling for 5th fastest place. 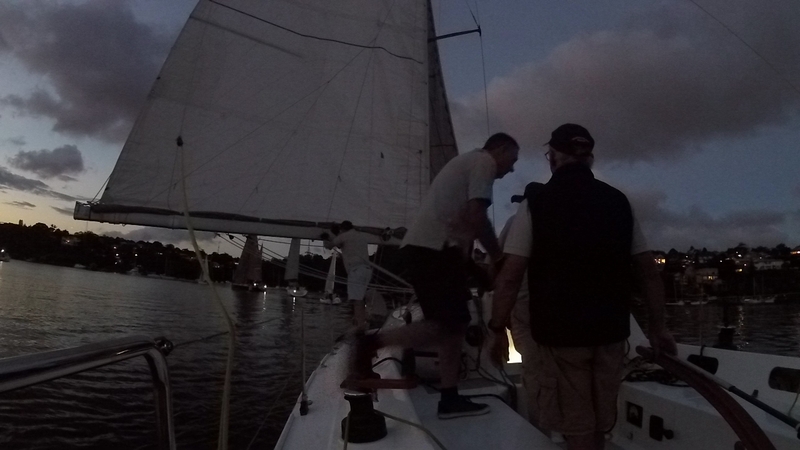 We were very fortunate that the rain held off and the breeze held in for a most pleasant twilight race and post race BBQ at Greenwich Flying Squadron. A large crowd filled the deck for the post race presentation and we were graced with the presence of all of the crew of Passion X. Under these circumstances it was fitting that we scored 4th place on handicap and courtesy of the absence of the winning crew from Avalon the prizes trickled down to us. Avalon were just pipped for fastest by Much Ado V and so far in front of the fleet that Much Ado V was second on handicap from Fireball who had a very good race finishing across the line on the tail of Jackpot. Andrew from Lisdillon gave me a pre race pep talk and the team from Harbour Dive Service gave the hull a thorough scrub just before the race so we were ready to go. 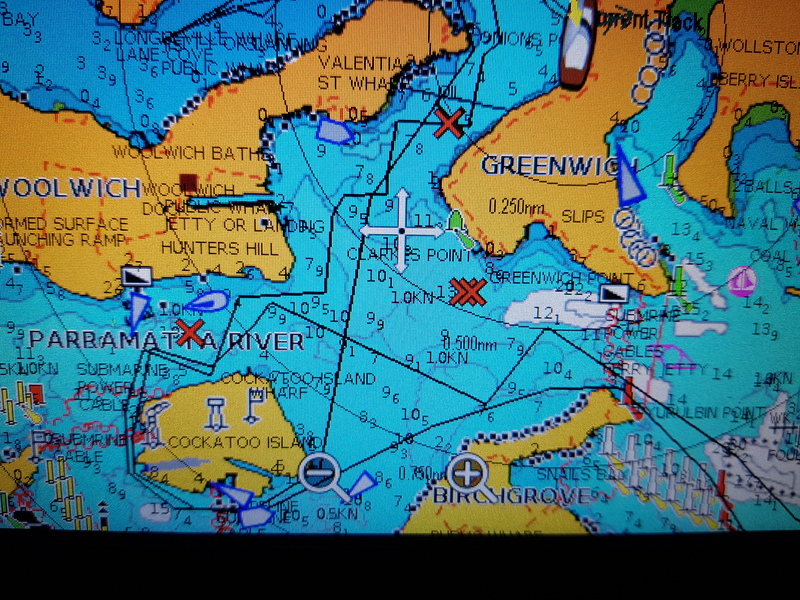 Our position at the club end of the line was good and Jackpot working the line on starboard elected not to come all the way so we had a good start. 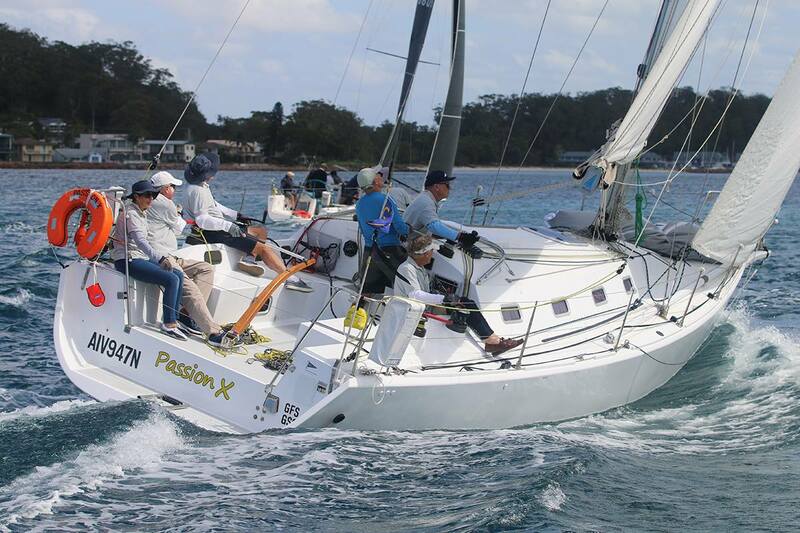 Both Jackpot and Passion X were headed into the rocks at Onions Point and had to tack away while some of the following yachts came away from the point on starboard in a different phase. Our GoPro cam shows Much Ado V, Lisdillon and Utopia with a nice lift on starboard above Passion X and Jackpot. At the point the wind came from every direction including nowhere where we sat becalmed. In one of those becalmed moments Jackpot tacked onto port in our water which necessitated a bit of manual intervention from Jackpot to prevent our prodder taking out their stanchions. 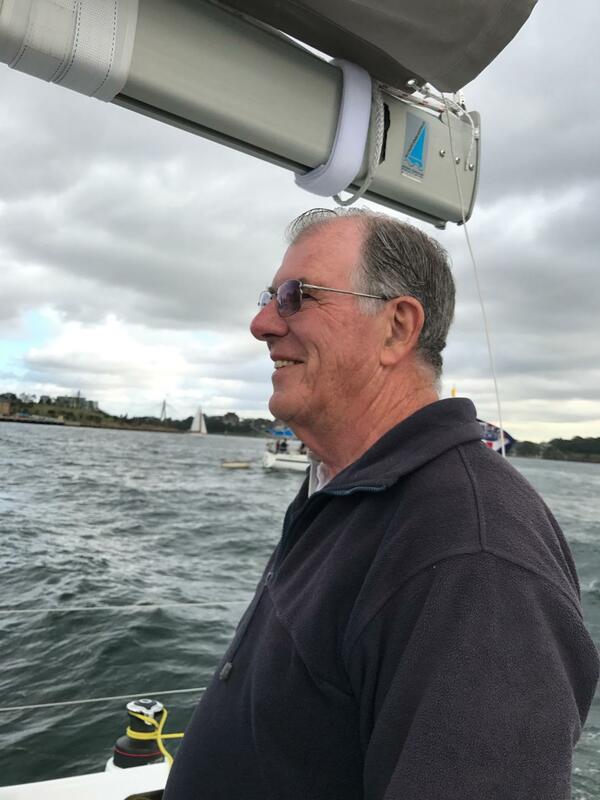 It was tricky conditions and the only matter I really objected to was to be thrown around onto port instead of being lead astern on starboard. Fireball went through to leeward along the shore and it was a long time before Jackpot and Passion X reached the line of breeze. Only Sweet Chariot was behind when we finally went off in chase. Jackpot pulled away in the breeze while we sailed through the lee of Fireball but we were all back together around Cockatoo Island. 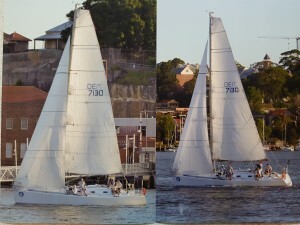 On the work to Goat Island Jackpot pulled away partly due to better speed and partly due to keeping away from the lee side of Cockatoo Island. 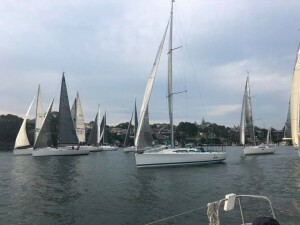 We stayed in phase with the breeze and were rewarded with a favorable wind direction at the approach to Goat Island that caught us up to Lisdillon and had us on Jackpots tail again. Joli was keeping a safe distance ahead and seemed to pull away after rounding Goat Island. On the run down Snails Bay we pulled away from Jackpot, Lisdillon and Fireball and made up some ground on Joli. We went deeper past the point and kept away from the wind shadow with good effect. Try as we might we could not pull back Joli and so followed them around Cockatoo Island for the work home. Through Humbug we took the Onions Point shore and with a favourable shift freeing up the breeze drew alongside Joli. The breeze went even further aft giving them clear air and a few seconds win across the line. Because of our poor performance on the previous three races we had a good handicap. Tonight there was less hard working and Passion X likes to be sailed free so it was all working in our favour offsetting the awful ugly episode in Humbug on the way out. Sailing was ugly on the way out of Humbug but the sky was interesting. Since our fastest time result in the third race of the summer series we have been going backwards in the fastest times order. In past series we have had the isolated 8th fastest result but this autumn series we have collected a treble of terrible results with a 9, 9 and 8th fastest. We do not expect to beat the Ker 11.3′s of the Sydney 38′s except in extraordinary circumstances and the J112′s and J122 are very hard to beat on the courses that suite them so I am pretty happy with anything better than a 6th fastest and pretty sad with anything worse than a 8th fastest when the whole fleet turns up. Tonight the two J112′s and one of the Sydney 38′s were missing so our 8th place was very disappointing. We did pinch a lot tonight and that in not one of our strong points. All too often we tacked and had to pinch along a shore where a longer course with wider angles may have been more successful. 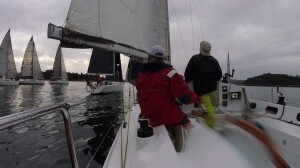 Also as a result of pinching we spend too long in the dirty air of the yachts in front. It has been six months since antifouling and perhaps it is time to have a very thorough scrub to freshen up the surface. Our maximum speed under motor has dropped off quite a lot so we will give the scrub a go and see the results. The breeze did die tonight leaving us with Sweet Chariot, Lisdillon, Irukandji, Ausreo and Fireball a long way behind. Ausreo and Fireball called it quits early while Irukandji found some wind and broke away. We were left with Lisdillon and Sweet Chariot at the back of the fleet and scraping home just within the time limit. Congratulation to Christian Beck on Dump Truck for a well deserved first and fastest result ahead of Utopia and Much Ado V. With more time in the boat Dump Truck is getting better and better and the new mainsail on Utopia seems to be doing the trick. After our result tonight one can only hope that some good photographs turn up on the Greenwich Flying Squadron facebook page. Some pretty awful wind shifts contributed to the last place on handicap tonight. I need the guys from Men in Black with their shining light to erase the memory of today’s race. We did all the rig adjustments and that seemed to work out fine. The over full head of the mainsail was corrected with letting off the D2′s and easing the top battens a few millimeters and we set the 40m2 second genoa which was the correct size for the night but from then things went pear shaped. (Not that pears are inappropriately shaped. It is just one of those old fashioned sayings.) On the Greenwich Flying Squadron Facebook page there is a six minute video of the yachts and from 48 seconds in to 59 seconds there is a view of the rig on Passion before the start. With the mast with more prebend and with the vang off the head of the main is freeing up well in the gusts. What a mess we made of the start! Instead of being up the line on port we ended up at the pin forced down there by Dump Truck as we both had to take starboard transoms. Once Dump Truck hardened up sharply we had no where to go except to the far pin and in dirty air. Only Much Ado V was behind but then they managed to get onto starboard coming of the Onions Point shore causing us more grief. Jackpot, Utopia and Joli all seemed to get away well up the line and used their clear air and ahead position to advantage. Dump Truck hugged the Onions Point shore for better breeze but the lift eventually came to the windward yachts who hardened up around Greenwich Point and took off towards Goat Island. From behind we managed to lift above Fireball and gradually pull away but we made little impression on Irukandji and Lisdillon who were immediately in front. At this stage Dump Truck and Much Ado V were not far ahead and we were reasonably happy with the performance except for the terrible start. No gains were made on the run and reach back to Cockatoo Island as in that strength of breeze Irukandji and Lisdillon are quite competetive on the run but the most frustration phase was yet to come. Along the Hunters Hill shore we moved well but once out into the Long Nose to Goat Island area we faced header after header and at the most inappropriate time. 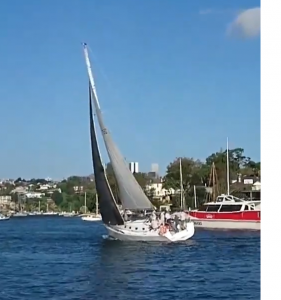 We tacked to round Goat Island only to be driven half way down the Island by one huge shift and in a sequence that was repeated a few times Irukandji and Lisdillon and the fleet in front drew further away. Had we been sailing or Lasers we most probably would have tacked back each time onto the lift but so frequent were the shifts we opted to hang on for a lift which did not come until we were on the next tack and it was a knock. 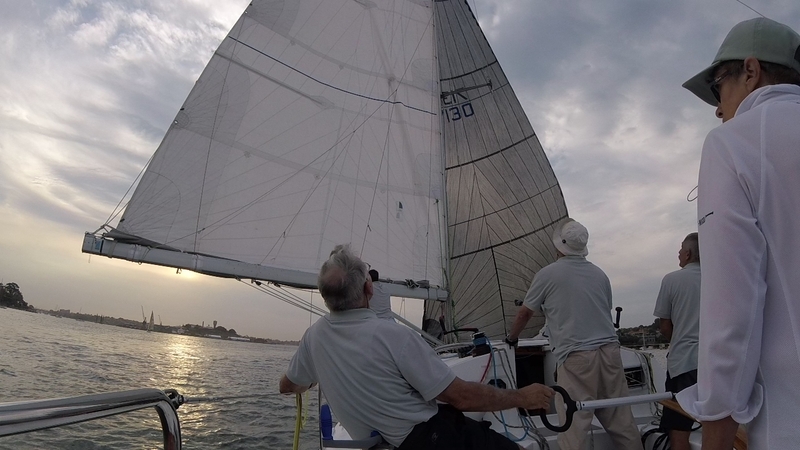 The last throw of the dice was the trip back from Goat Island to the finish. To our frustration we were caught in a very light air phase and made no ground. Into Humbug we came down with a gust from behind up to Lisdillon’s transom but no further but it was all too little too late as Irukandji and everyone in front was already over the line and dousing sails. Utopia with a guest driver was 10 minutes in front at the finish and Irukandji who was 4 minutes in front should take the handicap prize once the results are checked. They sailed well and deserve a bottle of wind. We deserved our last place on handicap and empty hands. That said we had an enjoyable evening battling the adversity of the wind shifts and worked well as a team. Passion X doing well shortly after the start. At the beginning however it was all roses as we took sterns right on the pin mark and started well to leeward of the chaos further up the line. Only the mighty Ausreo reached Humbug ahead of us and from the post race photos Lisdillon can be seen to windward of Ausreo so they must have had a good run from the line too. We were overlapped inside and could not go up above them had we wanted. 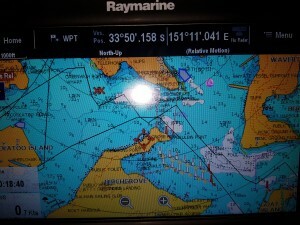 Also it was low tide and as we had started well to leeward we were very close in to Onion Point and had no where to go. 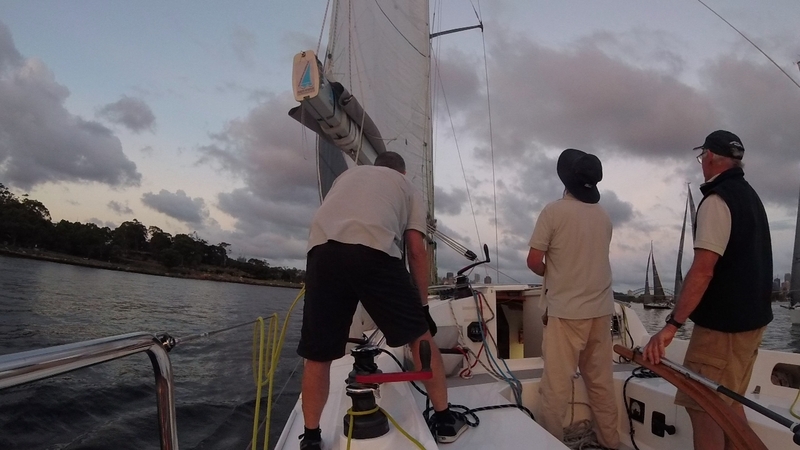 Fortunately Ausreo went up trying to maintain clear air on the charging light brigade and that left us alone to leeward with wind coming over our stern quarter giving us clear air and a clean run albeit a longer one. When we did come up we had Much Ado V in front and Dump Truck alongside. 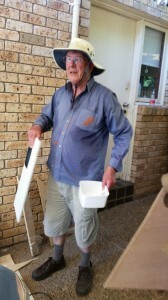 We had a cordial exchange with Dump Truck along the Cockatoo shore on who had rights but it mattered not as eventually they took off to leeward chasing the brother in the sister ship in front. Initially we had some favorable shifts that kept us in touch with Dump Truck but Utopia came through pretty quickly followed by Avalon, Ausreo, Irukandji, Jackpot and Lisdillon. Around Goat Island the large genoa helped and we emerged chasing the fleet back to the Long Nose corner hoping to make up ground. The square run with the genoa poled out down to Cockatoo Island was also a good run for us as we overtook Lisdillon and Irukandji and were on the tail of Jackpot and Ausreo. Initially we pointed up around Cockatoo Island to be clear ahead of Irukandji but once clear of the corner they were lifted well above our line. I think their difference in tacking angle was too much to be accounted for by our traveller being down 150 mm but whatever the cause it put us immediately on the back foot. Apart from being out of phase on the way back in the stanchion puncturing the foot of the genoa was not quick. First priority is to loosen the D2′s and reinstate the original cabin top centre sheeting. If these do not reestablish our correct mainsail camber and twist the battens will be loosened off. Congratulations to Much Ado V on a fastest times result and to Dump Truck and Utopia for the rare dead heat for second across the line. For the handicap results the heavy air specialist Ausreo took the prize from Utopia, Irukandji and Avalon. The transition back to the Spring handicaps caused a few problems but Harvey has that all sorted and yes we did dead heat for last on handicap with Jackpot and Avalon was catapulted from last to fourth place. Our tracks back through Humbug were not so bad. The others must have been spectacular.